US Navy photo by Mass Communication Specialist 3rd Class Michael MolinaChief Aviation Boatswain’s Mate (Handling) John Jacob directs an F-35B on the flight deck of the amphibious assault ship USS Wasp (LHD 1) as part of a routine patrol in the Indo-Pacific region. The US Marine Corps now has F-35Bs operating on US Navy ships in the Pacific, something no other military on earth comes close to. The F-35 will become a fixture on aircraft carriers and air bases around the US, ushering in a new era of sea and air power. 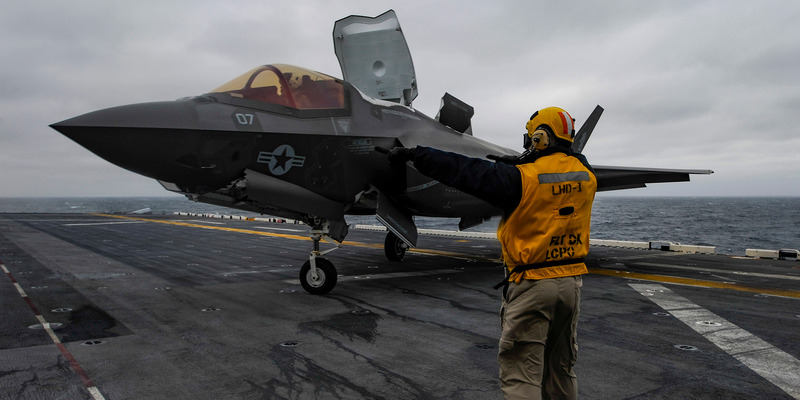 A US Marine Corps F-35B opened up its tail fan, blasted its massive jet engine downwards, and settled softly on the deck of the USS Wasp in what was the first Joint Strike Fighter landing on a deployed warship at sea in early March. A while later, another F-35B took off, and another landed. Within days, the procedure had become routine and unremarkable. But with the arrival of the F-35Bs on the decks of the US’s small carriers, and soon the US’s big carriers, naval warfare has changed forever. The Marines have tailored their whole operating concept to fit with the F-35, stocking ships with special helicopters and facilities to work on the next-generation jet that will become the workhorse of the force. The F-35B can takeoff in full stealth mode to penetrate enemy airspaces, it can carry scores of heavy bombs when stealth is no longer an issue, it can tank up with fuel and a detachable gun on the jet’s belly, it can use its futuristic sensors and communications to guide ship-fired missiles to targets on land. Russia has an aircraft carrier and a navy, so do China and India and a host of other nations. But nobody has anything like the F-35B out at sea, and starting this month no smart US adversary will ever look at naval warfare the same again.